It's been a while since I've had to plan a trip to Walt Disney World. Mom and I have been going since we first were married. We have done a lot of family trips over the years. When we do a family trip Amy does the planning for the group. Amy will check the crowd calendars and plan which park we are to go. She will make FastPass+ reservations for us. She will make dining reservations. All which are based around what my granddaughters, Tink and Minnie would like to do, see, and eat. The rest of us are happy for her to do this for us and watching the girls have fun at Walt Disney World is the best payoff for the trip. And if one of the FastPass+ just happens to take us to see Mickey, I don't mind getting my picture taken with him either. Well, in February, Mom and I are going to Walt Disney World for the first event for the 25th Anniversary celebration for The Disney Vacation Club, the 25 and Beyond Bash. The first resort in the Disney Vacation Club family was The Disney Vacation Club Resort, now called Disney's Old Key West Resort, opening in October, 1991. We became DVC Members in April 1993 after first visiting and touring OKW in 1992. We've lost count of how many trips we have made to Walt Disney World over the years. Mom and I have been a lot of time by ourselves. Gone are the days where you can just walk into the parks and experience all the attractions you have on your list to see. We would get up with only a vague plan of what we were going to do based on where we wanted to eat that day. Now, if you don't have a FastPass+ for an attraction you can stand in line for a long time just to see one ride. And if you don't have a dining reservation you may not be able to eat where you want. As a Vacation Club member I use to call Member Services for all reservations but for this trip I have been on line to make our reservations on the member pages on www.disneyvacationclub.com. I booked our room on the DVC Member site, our FastPass+ were all booked using My Disney Experience both on my iPhone and computer and dining reservations were made on line at www.disneyworld.com. I did have to call DVC Member Services to book our reservation for the 25 and Beyond Bash at the Magic Kingdom. After making reservations for our stay at OKW, I started by checking crowd calendars just as Amy has done for us in the past. I followed her lead and started a spreadsheet to map out our trip by first mapping out crowd levels for each day for each park. Thursday, February 25th. is the 25 and Beyond Bash so we are planning to be at the Magic Kingdom Thursday. So, planning around Thursday I picked what days to visit the Studios, Animal Kingdom, and Epcot. 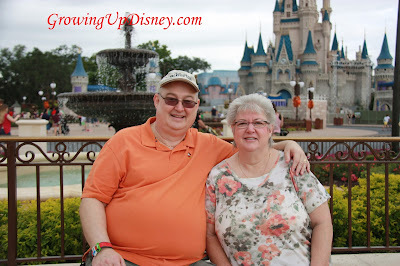 Our first day at WDW we will forgo a park and go check out all the changes to Disney Springs. So after planning out a Park for each day, I could book FastPass+ and dining reservations. Most days we booked lunch, but on Epcot day, we have dinner reservations at Le Cellier Steakhouse. Once Parks were selected for each day I used My Disney Experience app on my iPhone to pick FastPass+ reservations for each day. Then once Mom and I decided we wanted to do a table service lunch each day, it was back to the computer and onto www.disneyworld.com to check restaurant availability and book dining reservations. Then it was back to My Disney Experience and adjust the FastPass+ times to work around the dining reservations. When all plans were made it was back to the computer to create another spreadsheet for Mom to use. My Disney Experience has all my plans, including what park, FastPass+ and dining reservations for each day on my iPhone. Mom believes pencil and paper are the best thing ever so I make a printed schedule for her. So now we just wait until it is time to travel to Old Key West. Check-in has already been done on line for the resort. DisneyFloral has my order for Valentine's Day flowers to be delivered to our room. Now for the hard part, we just wait until it's time to go. Thanks for stopping by Growing Up Disney. How do you plan for your trips to WDW? Have you ever put together a spreadsheet to keep everything organized? Do you do your own planning or do you use the service of an authorized Disney Travel planner? Do you make dining reservations or do you try to find some place to eat where ever you are in the park when you get hungry? Do you make FastPass+ reservations in advance of your trip? Hello from a fellow DVC member! SSR is our home resort, but I love OKW. How exciting that you will be there for the anniversary event! I am a spreadsheet planner as well. MDE is nice, but I also have my own notes that I add and like having everything all on one page. I take a pic of the spreadsheet on my cell for quick reference, too. Comes in handy sometimes. Thanks! We will be hearing "Welcome Home" soon!